“Sand space” is a theme for the administrative backend of Textpattern CMS 4.6 and Textpattern 4.7 beta. Delicate shades of grey and touches of pale yellow are used to make the controls as un-intrusive as possible and let the user concentrate to the main task of creating stellar content. This theme is optimized to work on any device from small screen iPod Touch and mobile phones, to iPads, laptops, HiDPI portable computers and large screen desktop computers. Textpattern’s Write panel with Sand Space theme (version 4.7). Unzip and upload to your textpattern/admin-theme folder. Login and select the theme from the Preference panel > Admin sub-tab. You need to reload or switch between panes to see the changes. Alternatively, this theme is fully compatible with Stef Dawson’s smd_admin_themes plugin. v.1.01 – 20091008. Improved selectors for better performance; fixed some tiny bugs here and there in various browsers. Better image optimisation. Trying to work around an odd WebKit bug in the menus. v.2.0b – 201002. Private beta, never released. v.3.0 rc – 200101017. Rewriten for Textpattern 4.3.0 release candidate. v.3.0 – 20101106. Release for Textpatern 4.3.0.
v.4.04 – 20120827. 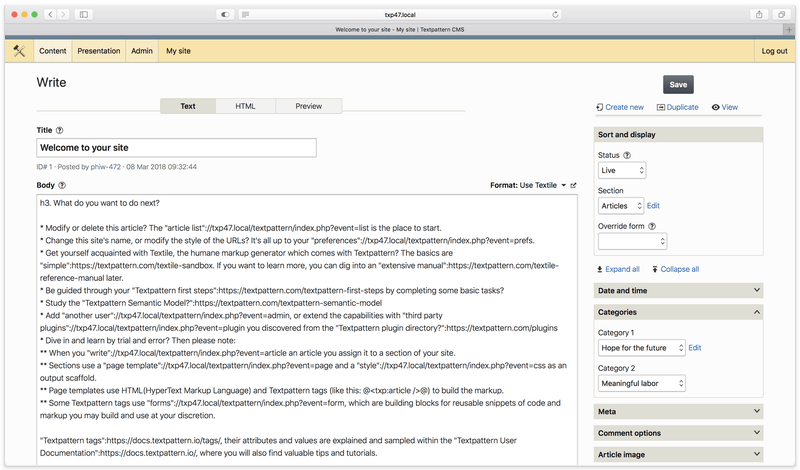 Release for Textpatern 4.5.0.
v4.6 – 20160911. Release for Texpattern 4.6.
v4.7 – 20180515. Release for Textpattern 4.7. Posted by Philippe Wittenbergh on 15 May 2018, 21:07 utc-9 , last modified on 19 December 2018, 16:56 utc-9 .